The Garfield Movie came out in 2004 and Ty Warner released a special set of seven Beanie Babies to be sold in stores. 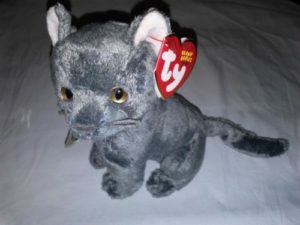 Over the years, Ty has made made many special sets of Beanie Babies for TV shows, movies and other entertainment ventures. The seven Beanie Babies apart of the Garfield set are: Arlene, Garfield, Louis, Luca, Nermal, Odie and Pooky. It appears the Pooky has the most value, as those can sell for over $10.00 online. The prices below are from completed auctions on eBay.